The smartcoins. I have called them the sharpest knives in my arsenal. In the markets' ebb and flow, they offer stability and interesting opportunities. However, the system fails when the value of the collateral gets too low and the debt too high. Which we have seen in recent months. The scope of this proposal is to harden them. It is also much, much more. I tend to swat as many flies as I can when I do things. Sounds like a dream? Yes, indeed. But I think it is possible. And not to exclude other ways to make the system better, I think this will be a perfect solution. Because it is use that makes the smartcoins viable. This is an attempt to do just that. Enabeling dormant portfolios, taking the strain off users, making BTS holding meaningful in falling markets as well as in bull markets. This system will use the short term movements and accumulate as time goes by. This strategy is not new. It is called rebalancing. It has been used through all times in order to secure portfolios. In this case I want to use it to fix the shortcomings of the market in the DEX. For the benefit of the users and of course to hone the system to a level where the bit-assets are recognised as a de-facto standard. And of course secure life, property and freedom. Automation is needed. I can't see myself calculating everything I do. I need a system that works when I sleep and I don't think i'm much different from others in this respect. Only committee controlled bit-assets allowed. If someone wants to repurpose it, fine. But for the shareholders, this is most beneficial. Rebalancing happens at feedprice, rather than market price. This to add liquidity where it is needed and to tighten the peg. This is not an attempt to maximise profit per trade, but will regardless score small profits and add to the holdings. User control over which assets, the weight, how often and how much change is needed to trigger an event. Notice that this system works by percentages rather than absolute numbers. And none of the sliders go beyond 50%. Which means the minimum number of assets is two. And I think it's enough with a total of five different assets. At least initially I think that the BTS amount should default to 50%. It could be higher or lower, but for clarity, 50% is a good umber for BTS. Also notice that t should be easy to withdraw and add new funds. This is on purpose, since it would trigger a rebalance on next interval. The only thing left from withdrawal is (of course) BTS which would require canceling of the portfolio. If one asset goes to zero, all is lost! So this has to be considered. And pointed out to the end user. However this risk is something everyone has accepted by holding 'shares in the first place. 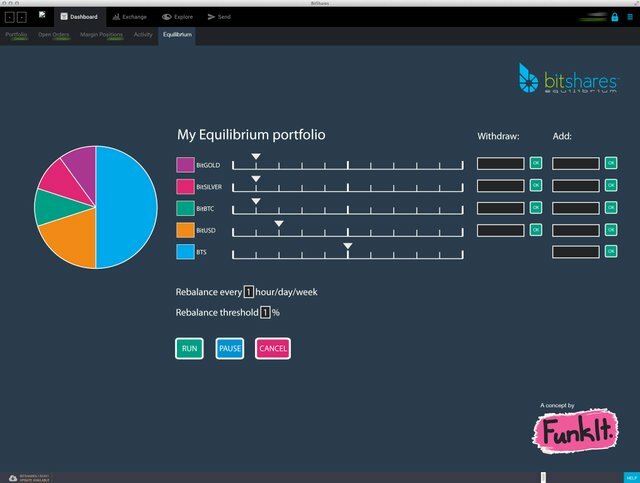 The Bit assets on the other hand are for the most part non-speculative and should be perfect for this purpose with the possible exception of BitBTC. There is a problem with globally settled assets. This could be solved by a gentle warning. I have tried to figure how a global settlement would be with sufficient Equilibrium portfolios, and without trying, I think even then, the assets would be close to peg. That is IF sufficient numbers will keep the settled asset. We need to hone the strengths of the platform. And this is a simple way to do it. The infrastructure is there and there is very little required to make this happen. The logic required to program this is very simple. The UI could be a little more tricky, but not over the top difficult. I admit this is creating an artificial demand, but I see why not? This market is not perfect and since DEXBOT has failed to make an accessible solution to automated trading, this is is by design meant for everyone. Leave a comment and exuse my spelling errors. I just needed to get it out.